1.Touch Screen & voice guide all around operation with LCD indication. 2.Programmable 32 wireless and 8 wired defense zones. 3.Enable to enroll wireless doorbell and control house appliance by appliance switch. 4.Enable to record and inquiry 120 alarm event messages. 5.Compatible with CMS machine with CID protocol. 6.Panel on-line status can be tested by sending signal to CMS at preset time. 7.Wired /wireless zone real time monitoring and indicate zone fault. 8.Long distance wireless detector signal can be repeated by repeater used. 9.Supports neighbour report alarm instead in case tel line off. 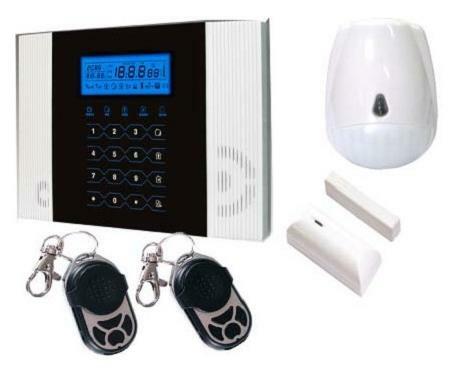 10.Other features such as tamper-resistant, low power alarm, telephone cut alarm etc. 11.GSM Alarm function: use GSM network for SMS text or voice alarm report to user and CMS. 1.Area data: 8wired and 32 wireless zones, supports 8 remote controllers. 2.Zone type: delay, perimeter, burglar, emergency, fire, gas, key zone, door bell zone etc.